Perry Cross is an inspirational Australian. A rugby tackle in 1994, at the age of 19, left Perry Cross a profoundly disabled quadriplegic, unable to move and on a life support machine… with a team of around-the-clock medical carers at his side. Faced with a life of oblivion – he made an immensely courageous choice to ‘get moving’. The challenge lay before him – the fight to live, then to talk and eventually to defy doctors and live outside the hospital. He not only achieved this – but has excelled in life ever since. He’s been heralded by media worldwide as a tremendous role model for the human spirit in overcoming the odds. 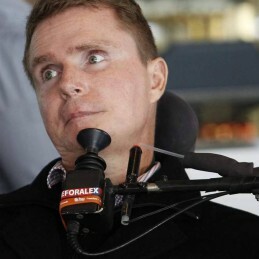 Since the accident, Perry has focused on living a busy and fulfilling life ensuring he contributes to the discovery of a cure for paralysis and growing awareness of the need for research and advancement in the treatment, management and cure of paralysis. Perry’s achievements since his accident are numerous and inspirational. 1996 Perry became Australia’s first motivational speaker on life support and was runner-up in the prestigious International Communicator of the Year Awards. In 1999 was finalist in the Young Australian of the Year Awards. In 2000 Perry was the first quadriplegic on life support to have received a degree at University. In June 2002, Perry met with the Governor-General and the Prime Minister as an envoy for Christopher Reeve, lobbying them for the legalisation of stem cell research. Perry has become one of Australia’s most inspirational speakers. Numerous radio, newspaper and television interviews have made Perry a recognisable identity in the community at large.